Google, Outlook, Plaxo, oh my! 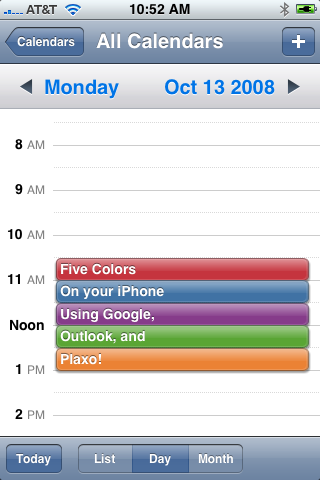 Syncing Multiple Calendars on the iPhone in Five Colors! After recently getting married, I realized that my schedule is not the only one that I have to take into consideration. Truthfully, T and I have been together for over 4 years, so our schedules have slowly merged anyways. However, it’s nice to be able to view each other’s calendar during times when we need to consider making joint appointments. I’ve been a Google Calendar convert for over a year now, but I still rely on Microsoft Outlook as my main organizational program at home. On the road, I’ve got my trusty iPhone as my gadget to rule them all. So, the question is, can they all get along? Prior to the iPhone, I was a Pocket PC/Windows Mobile user, and Activesync made sure that my Outlook was kept in sync with my phone. When I started using Google Calendar, I needed to find a way to keep that also in sync. I can’t remember how many different programs I used. I do remember some of their funny names, however. Funambol, GSync, Goosync, and Plaxo were all services/programs that I gave the old college try with. Plaxo was the one that I eventually stuck with, as it smoothly synched my Google Calendar with my Outlook. It was not a cure for syncing my Samsung i760 to Google Calendar directly, but I was willing to live without that OTA capability in exchange for ease of use and reliability. Thankfully, I did experiment with Plaxo enough that it remained on my computer when I switched over to the iPhone. A little google search revealed a nice post that discussed the setup that I eventually stumbled upon myself. In the author’s post, he reveals how to sync multiple Google Calendars to your Outlook (using Plaxo), which then you can sync to your iPhone (via iTunes). I can verify that this works smoothly, and if you have any questions, feel free to leave a comment below. Now that you’ve got multiple calendars on your iPhone, how can you assign the colors? I mean, is it me, or is orange to close to red to be assigned as the second colored calendar? Well, sure enough, there is a fix, and again, I can’t take credit. Your iPhone can show calendars in the following colors: red, orange, blue, green, and purple. The trick is that it assigns them in that order. Fortunately, there is a fix, and the post will effectively walk you through. However, I will add a suggestion that when you make a “dummy” calendar to take a color, make sure that you have at least one “dummy” event, as my iPhone didn’t recognize the calendar otherwise. Again, feel free to leave a comment if you have questions. I promise to respond in a timely manner.